Mary Halsey of Rhode Island is joined by the rapper Missy Elliott in a surprise performance on The Ellen DeGeneres Show. 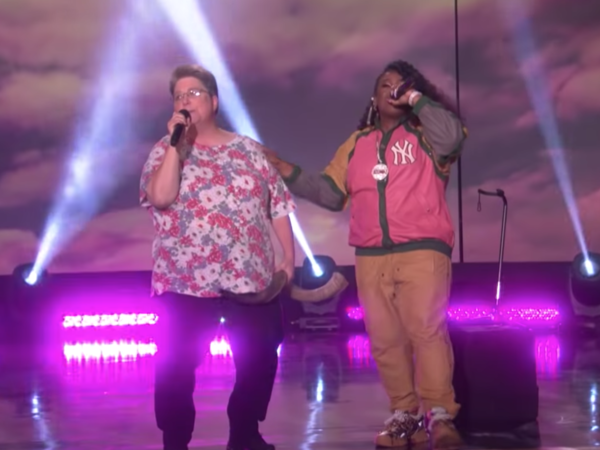 Last month Mary Halsey of Rhode Island posted a Facebook video of herself doing a karaoke version of Missy Elliott's "Work It." It quickly went viral, accumulating millions of views and drawing attention from Elliott herself who praised the performance on Twitter and called Halsey her "funky white sister." Now Elliott and Halsey have officially performed the classic song together. Halsey appeared on The Ellen DeGeneres Show Thursday to share her story and rap her karaoke version of "Work It" for the audience. But soon after taking the stage, Missy Elliott strolled out to join her. Halsey, clearly stunned, quickly shakes off the surprise, throws her arm around Elliott and keeps on working it. "I wanted to cry tears of joy," Elliott shared on Twitter after appearing with Halsey. "Mary is one of the sweetest souls I met."